Cry havoc and unleash the dogs of war…for gun control. This appears to be the mantra of the left in the wake of the horrific mass shooting in San Bernardino. The perpetrators were officially identified yesterday as Syed Farook and Tashfeen Malik, both in their late-20s, who opened fire at a Christmas party for the county’s health department workers; Farook was a county employee of five years prior to his senseless rampage. They killed 14 and wounded up to 21 people in the worst mass shooting since Newtown in 2012. They were subsequently killed in a firefight with police and both were armed with AR15 rifles. It’s absurd that one of the richest, freest, and most advanced societies in world history endures such a scourge with such equanimity. But there is hope. A Gallup poll in October found that 55% of Americans support stronger gun control measures, and other surveys have found that even a majority of NRA members support mandatory background checks — something the NRA itself has assiduously opposed. There is broad political support for stronger laws to address the nation’s gun addiction, but gun control advocates have so far been unable to counter the money and organizational heft of the NRA. It’s obscene that a single interest group is able to endanger an entire nation’s safety. This crisis in American society must be combated through the ballot box, and through lobbying to loosen the iron grip the NRA holds on Congress and many state legislatures. That is where the pushback against this culture of death needs to occur. And it needs to occur now. THE 57-year-old man charged in the murderous shooting spree at a Planned Parenthood clinic in Colorado allegedly made remarks to police about “no more baby parts.” That has led some to speculate that antiabortion rhetoric sparked the rampage. The suspect’s history of aberrant behavior prompted others to theorize that mental illness was the culprit. In the early stages of the investigation, we don’t know what, if any, role was played by either of these factors. In the meantime it is worth restating the obvious: The one factor common to every terrible case of gun violence is access to guns. So far this year, according to news reports collected by a Reddit community, there have been at least 351 mass shootings, or more than one a day. Over at the New York Times, Nicholas Kristof was more measured in his response to the San Bernardino shooting. He acknowledged that the Republican effort to do something regarding mental health was a good policy initiative. Yet, he also repeated the long debunked statistic that 40 percent of all gun purchases were conducted without a background check, along with the pie-in-the-sky assumption that universal background checks makes us safer. Any law-abiding American who buys their firearms though a FFL dealer must undergo a background check. That is the law. Private sales exist, but they’re mostly relegated to transactions among families (i.e. inheritance), which are often given exemptions in these expanded background check laws. The 2013 Manchin-Toomey bill that would have increased background checks included that exemption. Astonishingly, it’s perfectly legal even for people on the terrorism watch list to buy guns in the United States. More than 2,000 terrorism suspects did indeed purchase guns in the United States between 2004 and 2014, according to the Government Accountability Office and The Washington Post’s Wonkblog. Democrats have repeatedly proposed closing that loophole, but the National Rifle Association and its Republican allies have blocked those efforts, so it’s still legal. I will give the LA Times some credit–they didn’t give the horrifically inflated figure on gun deaths that pro-gun control groups often peddle to make a case that America is a shooting gallery. As I’ve written previously, it’s not. Violent crime is at record lows, firearm-related homicides are down, and this editorial board knows that California is one of the most anti-gun states in the country, right? California has long banned certain long guns that the left ridiculously calls “assault rifles” since 1989. It also has a universal background check law. Oregon also passed legislation mandating universal background checks for all firearms sales; it did nothing to stop Christopher Harper-Mercer from committing a mass shooting at Umpqua Community College in Roseburg back in October. Moreover, yes, Gallup did report that Americans want more gun control, but if the editorial board read the whole poll–they would have found that 56 percent felt concealed firearms would make the country safer. 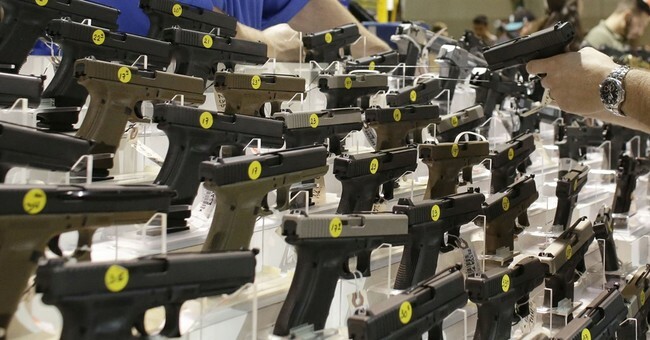 Additionally, the Washington Post’s July analysis found that 57 percent feel that guns help prevent crime. As with anything with polls, wording matters. In the wake of Newtown, 58 percent supported a ban on semiautomatic weapons. Yes, Gallup noted that support for a handgun ban is near record lows. The point: a handgun is a semiautomatic weapon. It merely means self-reloading, which adds to the growing evidence that the media and the progressive left know little about the nomenclature of firearms, let alone the laws that apply to them. A pair of township boys are accused of shooting four others with a pellet gun, police said. Nobody was seriously hurt by the 11- and 12-year-old boys who shot the pellet gun at them on April 25 in the Twinbrook Village apartment complex, Detective Lt. Kevin Faller said in a statement. Of course, many publications omitted the fact that they’re citing Reddit. Those documents vindicate our; concerns and warnings about a massive, virtually standardless government watchlisting scheme that ensnares innocent people and encourages racial and religious profiling. The documents confirm what we have long suspected: It doesn’t take much to get yourself on a terrorist watchlist. The government’s recently leaked Watchlisting Guidance starts with a poorly defined “reasonable suspicion” standard and then subjects it to so many exceptions and caveats as to render it virtually toothless. The unsurprising result, as is clear from these documents, is a set of watchlists experiencing explosive growth. Predictably, that “explosive growth” has led to the entanglement of almost 300,000 people who have “no affiliation with known terrorist groups” but who fall under “reasonable suspicion” nevertheless. As a result, the question here shouldn’t be “why does the NRA oppose using this list in a civil context?” but “why doesn’t everybody oppose using this list on a civil context?” Whether the New York Daily News likes it or not, the right to keep and bear arms is protected by the U.S. Constitution and cannot be restricted without serious cause. Of course Second Amendment advocates are opposed to the importation of this list into the firearms background check system. They understand well that it cannot be relied upon as a justification for denial. Whatever Everytown and their friends might imply, we are not talking here about selling guns to people who have been convicted in a court of law; that is already illegal. Rather, we are talking about selling guns to people who, as far as the state is concerned, have done nothing wrong and who must not therefore have their liberties abridged. It is an ugly testament to the illiberalism of many modern-day progressives that they are happily lining up on the authoritarian side against not just one, but two of America’s premier civil rights organizations. To demonstrate how easy it is to get on that list and not do anything wrong, just look at the Weekly Standard’s Stephen Hayes. He suspects he was added to the list for taking a one-way flight to Turkey last year. This does not mean that 1,119 terrorists found a loophole so they could openly buy guns and/or explosives in America. The “Terrorist Watch List,” like the “No-Fly List” and other secret government black lists, includes the names of suspects, relatives of suspects, friends of suspects, former college roommates of suspects, and more. No doubt these inclusions are useful for FBI agents and other officials as they search for terrorists and their accomplices, but they are not vetted lists of bad guys. The problem with this unconstitutional idea is that you can find yourself on one of these lists by having the same name as a suspected criminal or terrorist or by simply traveling to Turkey [like Hayes], and if you are on a list, you may not be able to determine which one you are on, much less get yourself removed. Basically, such a power would give the federal government the ability to make secret lists that could be used to take away a constitutionally protected right from anyone it chose—even the late Senator Ted Kennedy once ended up on a “no-fly list” for reasons that were never made public. And, Mr. Kristof–unlike Democrats, Republicans can–and do–disagree with one another. Ronald Reagan was right on a lot of things–he was wrong on guns. Just as it’s wrong to suggest that waiting periods curb gun violence since there’s no evidence to confirm that point. Given that the San Bernardino shooters seem to have been radicalized; Tashfeen Malik reportedly swore an oath of allegiance to ISIS–this is an issue about possible terrorism, not guns. But there’s no political points to be scored by liberals, Democrats, or the overall left wing in that discussion. Last Note: Support of gun control dropped to pre-Newtown (below 50 percent) levels by December of 2013. There might be a slight uptick in support, but we should expect support for gun rights to remain strong, especially since this shooting is looking more and more like it was influenced by radical Islam. Also, we shouldn’t be surprised if the number of Americans who feel safer in neighborhoods with firearms increases. In June, Rasmussen found that 68 percent agreed with that sentiment.